Let your imagination run free and travel without leaving your home! 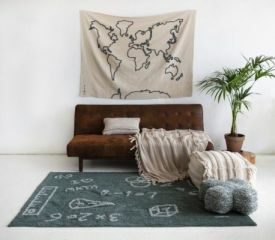 Machine-washable rug (conventional washing machine with 9 kg capacity), 100% cotton, with gray background and a world map with all the different continents in light gray. 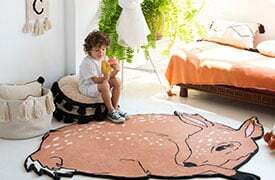 Elegant but fun, it is perfect for children's rooms, for both boys and girls. Made by artisans, it is safe thanks to its natural dyes, and light, soft and flexible since it is made entirely from cotton.